Today we have an 8am start to visit Angkor Tom and the Bayon. It was so hot during our time at the temples. So hot, you just couldn't enjoy it. I was so glad when we were able to get back on the bus to head back to the hotel. We all head straight for the hotel pool. We grab lunch at the hotel and have a nap. 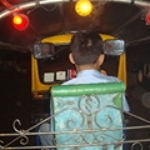 This evening Feb & I head via tuk tuk to Bar Street. We head to the Temple Club to dine and watch some Aspara dancing. The food was awesome and the show beautiful.